Both a union representative and one from TransCanada—the company behind the Keystone pipeline—affirmed that the 19-week timeframe was total fantasy. The portion of the Keystone pipeline that remains to be built is 1179 miles long. Construction should take two years. This may be true but, as you’ll see, it belies several important details. 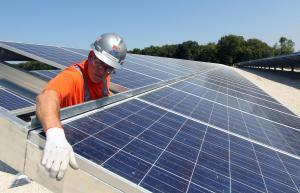 Plenty of cause exists for Republican lawmakers to “disdain” the growth in renewable energy. First, efficient and effective coal-fueled electricity that has provided the bulk of America’s power is being prematurely shut down by regulations promulgated by the Obama administration. It is virtually impossible to get a new coal-fueled power plant permitted in the U.S. Even natural gas-powered plants meet with resistance. And, of course, just try to build a nuclear power plant and all the fear-mongers come out. What’s left? Renewables, such as wind and solar, receive favorable treatment through a combination of mandates and subsidies. The brand new report, Solar Power in the U.S. (SPUS), presents a comprehensive look at the impacts of solar power on the nation’s consumers. We’ve seen companies, such as Solyndra, Abound Solar, and Evergreen Solar, go bankrupt even with millions of dollars in state and federal (taxpayer) assistance. I’ve written extensively on these stories and that of Abengoa—which received the largest federal loan guarantee ($2.8 billion) and has resorted to questionable business practices to keep the doors open. Knowing the importance of the “incentives,” the solar industry has now become a major campaign donor, providing political pressure and money to candidates, who will bring on more mandates, subsidies, and tax credits. Those candidates are generally Democrats. The GOP doesn’t “disdain” solar, but they know it only survives because of government mandates that require a certain percentage of renewables, and specifically solar, in the energy mix, plus the subsidies and tax credits that make it attractive. Therefore, they can’t get excited about the jobs being created as a result of taxpayers’ involuntary investment, nor higher energy costs. The blog post compares the “solar energy disruption” to what “occurred when DirecTV and Dish started to compete with cable television. More choices emerged and a whole lot of new jobs were created.” However, those jobs were created through private investment and the free market—a fact that, along with solar’s dependence on incentives, he never mentions. SPUS draws upon the example of Germany, which has led the way globally in renewables. Over time the campaign has contributed to residential electricity prices more than doubling. Renewables receive favored status, called “priority dispatch,” which means that, when renewable electricity becomes available, the utilities must dispatch it first, thereby changing the merit order for thermal plants. Now, many modern power plants couldn’t operate profitably and, as a result, some were shut down, while others were provided “capacity payments” in order to stay online as back-up—maintaining system stability. In Germany’s push for 80 percent renewable energy by 2050, it has found that despite the high penetration of renewables, given their inherent intermittency, a large amount of redundancy of coal- and natural-gas-fueled electricity (nuclear being decommissioned) is necessary to maintain the reliability of the grid. As the German experience makes clear, without a major technological breakthrough to store electricity generated through solar systems, “100 percent solar by 2030” is just one more fantasy.